The 1888-89 Allen & Ginter baseball card sets are some of the most popular Pre-War sets ever printed. Although known for being one of the earliest baseball cards sets, the manufacturers of the Allen & Ginter cards were more interested in printing cards of the World’s Champions in all sports, so baseball players make up only a fraction of the set. Topps continues to print modern Allen & Ginter cards using current baseball players and athletes of other sports. However, it is difficult to recreate the popularity of the original two sets released in 1888 and 1889. The Allen & Ginter Tobacco Company was originally established by John Allen and Lewis Ginter in Richmond, Virginia in 1875. The company played a key role in the development of the city of Richmond. In 1890, shortly after the Allen & Ginter sets were released, the Allen & Ginter tobacco firm was purchased by the American Tobacco Company, the tobacco industry leader. 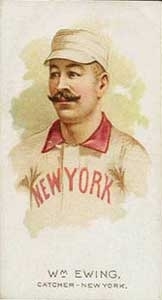 The 1888 N28 Allen & Ginter baseball card set consisted of 50 cards, but only the first ten cards featured baseball players. The cards measure 1½” by 2¾” and include boxers, wrestlers, track stars, and even swimmers. The N28 cards can be distinguished by the Allen & Ginter advertisement on the front. The back of the card features a checklist that clarifies to which sport each person belongs. The 1889 N29 Allen & Ginter baseball card set also consists of 50 cards, but this time includes only six total baseball players. These cards have the same dimensions and N28, but a different checklist. 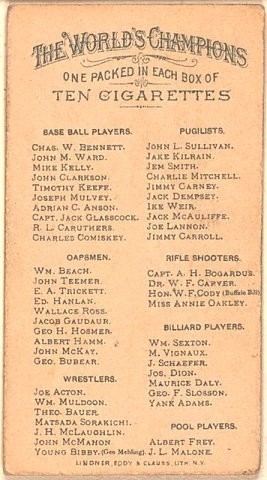 The N29 baseball cards can be distinguished by the placement of the players’ positions and teams on the front of the card where the advertisement for Allen & Ginter tobacco used to be. The N29 Allen & Ginter cards also came with an album. The album is a large 6” by 8” with 14 pages designed to collect the Allen & Ginter cards from the cigarette packages. 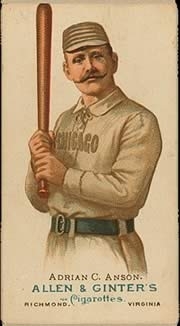 DeansCards.com is always looking to purchase original Allen & Ginter cards. If you are interested in selling Allen & Ginter or any Pre-War baseball cards, please click here. If you are interested in viewing our Allen & Ginter reprints, please click here.